Today is the day the duchess died. 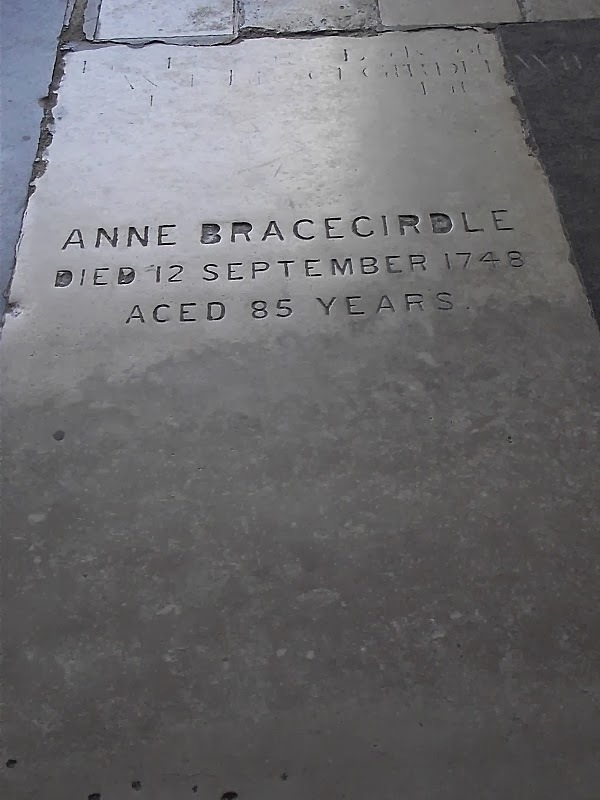 Because her birth date went unrecorded, this is when I commemorate her. What better time to share my great discovery? I knew I wanted to write about the duchess and her duke long before the time was right. The idea came to me when I was bound by a multi-book contract. In one of those novels I created a fictional descendant of theirs as heroine. The most intensive period of research and the writing of an early draft took place while I served as an elected official. An important part of my process, whether writing about historical or fictional characters, is collecting people pictures. For real people, prominent people, I have the advantage of searching out their portraits. And because the duchess was an aristocrat--and a beauty--she was a popular subject. Same for the duke, because his father was a king! 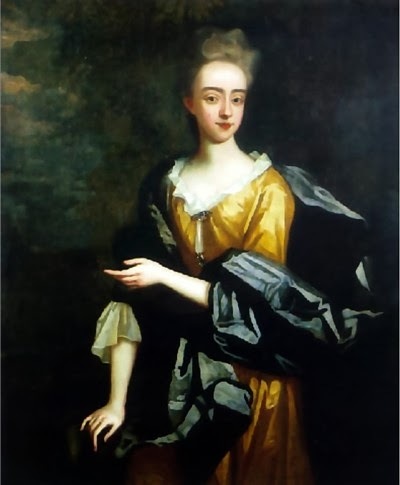 The portrait that posed a great mystery was what I refer to as "the wedding portrait," painted in 1694. Kneller licenced John Smith the engraver to make a mezzotint, and copies were sold to the public. The National Portrait Gallery in London has one of the prints, though not on display. I considered myself incredibly lucky to obtain one for myself, which had turned up in a car boot sale! Staring up at the sepia tones of the engraving, I wondered what had become of the original oil painting. What colour was her dress, her shawl? A little research proved disappointing--the picture's fate was a mystery. I could only theorise about what happened to it. One of the duke's 18th century successors was forced by debt to sell or auction some of his possessions--in Brussels, no less! In the 19th century, a great fire broke out at the family's country estate. And I'm sure there were other dispersals over time. I assumed it was forever lost...until a week and half ago, when I found it. The duchess was a victim of misidentification. It was that simple. Her portrait was correctly attributed to Kneller, but someone, somewhere, sometime had decided that she was a French aristocrat rather than an English duchess. Here she is, in her lovely yellow silk dress and shimmering blue satin shawl. And here is my engraving. As you see, John Smith felt free to make slight alterations in the shape of her face, and he softened the arrangement of her hair. My work as a art sleuth isn't over yet. I'm still trying to obtain information--and, I hope, a study print--of that fourth portrait. The only description of it refers to her as wearing a white gown with a red mantle. I'm sure it must be stunning...I hope one day to see it! A very Happy 2014 to you. So much has happened since my last post, not all of which is pertinent to my writing. In November I made my annual trip to the UK﻿. 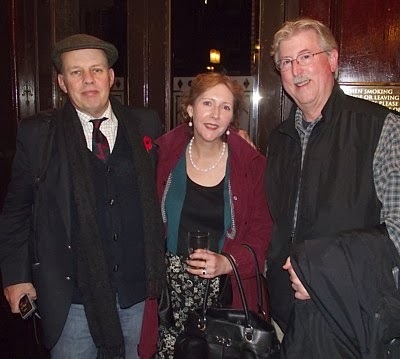 As soon as my plane landed, I hastened to the London Historians' monthly pub night, taking place only a short walk from where I was staying. I received a very warm welcome, met people I'd known chiefly via email and Facebook and their blogs, and made new friends. 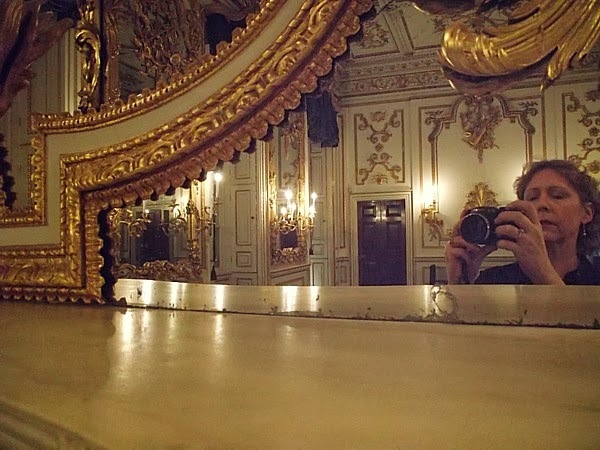 Either intentionally or by chance, I'm forever coming upon locations where I've set the action of my novel, or places connected to my characters. 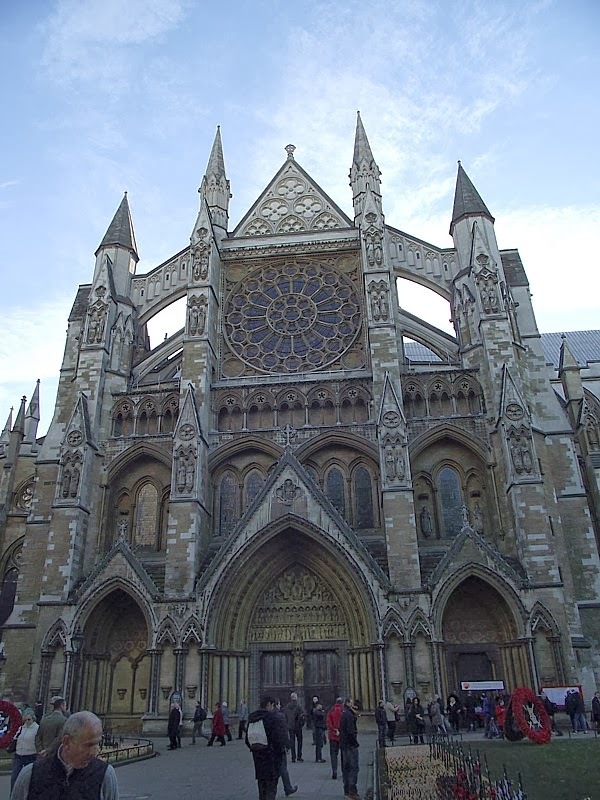 The duke, his royal father, his father-in-law, mother-in-law, and some of his children are buried in Westminster Abbey, also the setting for coronations and funerals. 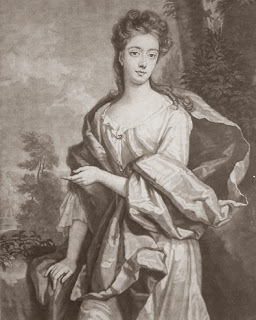 Actress Anne Bracegirdle appears in one scene. I always pay my respects when there. 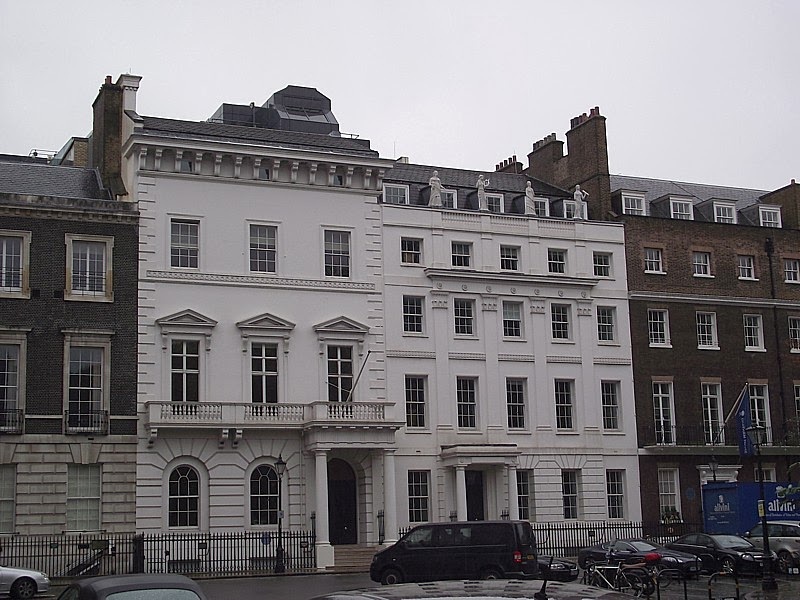 When meeting a friend for lunch at the Army and Navy Club in St James's Square, as usual I photograph the house in which the duchess lived during childhood, before her father moved their household to Whitehall. 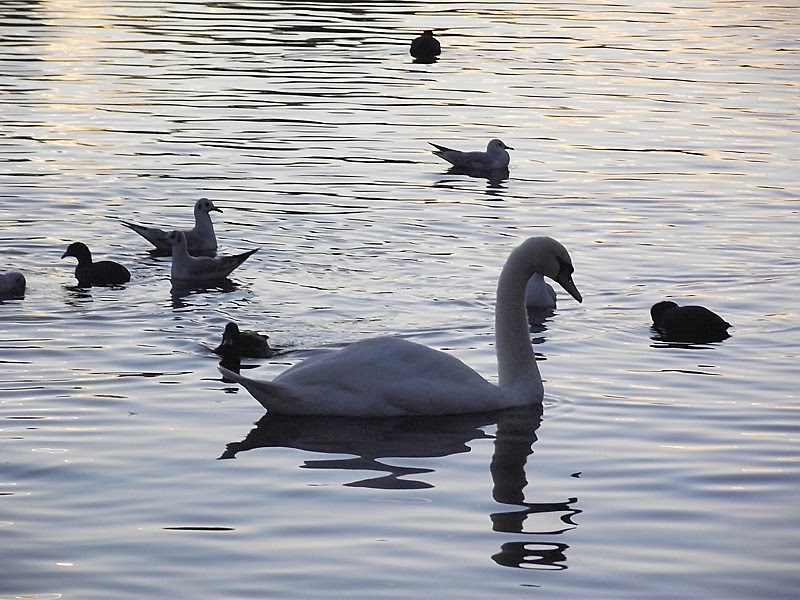 Although I took this photograph in Hyde Park, King Charles II took a personal interest in the fowls in St James's Park, as demonstrated in an early scene in my novel. This splendid gilded room in the Victoria & Albert Museum was the music room of Norfolk House, also in St James's Square. On my visit to the V&A I saw the "Pearls" exhibition. Of particular interest to me was Queen Mary II's pearl necklace, as she is such a significant character in the book. Other exhibitions I visited were "The Cheapside Horde" at the Museum of London (it was a very bling-y trip! ), "Georgians Revealed" at the British Library (where I also accessed and transcribed 17th century letters written by the Earl of Oxford), a Victoriana installation at the Guildhall Art Gallery, "Elizabeth I and her People" at the National Portrait Gallery, and the Gillray caricature exhibit at the Bank of England Museum. It wasn't all museums and research, however. I did lots of my Christmas shopping, saw author and non-author friends, dined in favourite restaurants, and wandered streets and parks. It was rather a muted Christmas, as my father passed away only days before. In addition to being an unexpected loss, I'm sorry and sad that he'll never have a chance to read this novel. As a military man he'd have particularly appreciated the Siege of Belgrade! At the start of this week, I solved a mystery that has puzzled me for nearly a decade. I'll share that revelation in an upcoming post . . . .